It goes without saying that life is challenging. Some challenges we seek; some find us all by themselves. Dealing with them effectively determines the quality of our life. Much as succeeding in life, getting to the top of Mount Everest requires the ability to meet and respond to what can seem insurmountable. Everest stands 29,028 feet, 5 and ½ miles above sea level and, much as life can be, it’s not “user friendly” for the unprepared. (1) Prepare mentally and physically for your climb. Life and climbing both require mental and physical stamina and endurance. Of the two, the mental part is the most important. Focus on what you want and not what you fear. You are what you think about constantly. Positive thoughts, positive focus, and disciplined realistic goal setting lead to more satisfying outcomes. (2) Find a good guide. Don’t reinvent the wheel. We all need help when things are challenging. Find someone who has made “the climb” and knows the way there and the way back. A good guide, in climbing and in life, helps you develop the skills you need so you’ll be able to do it on your own in the future. Asking for help is not weakness, it’s smart. 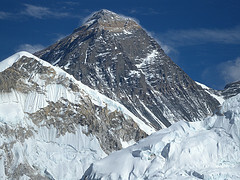 The challenges we face in life are like the weather on Everest. It’s neither for you nor against you. Mother Nature’s neutrality, however, is unforgiving. Life’s challenges can be the same way. They are merciless with those who fail to adapt! (3) Plan a way there. Moving without thinking can be disastrous. Know your destination, and plan a process to get there. Proper planning prevents poor performance. (4) Plan a back up route. If Plan A doesn’t go the way you expect, and always assume that it won’t, have a “fall back” plan. Studies show that our decision making isn’t as effective when we are trying to make decisions under stress. Don’t try to “wing it” when the clock is ticking. (5) Sometimes to go up you first have to do down. Always keep your focus on the goal you’ve set. All that matters is that you get there and back safe and sound. Don’t get hung up on it looking or being a certain way; sometimes you have to retreat, or wait, or side step to get where you want to go. The only thing that matters is getting there! (6) Listen to the mountain. Any challenge forces us to be more flexible and creative in our response; if we didn’t need to adapt and become more skillful to deal with what’s happening then it wouldn’t be really challenging after all. Pay attention to what your efforts are creating. Known as “sensory acuity,” this is the skill of noticing what you are getting as a result of your actions. If something isn’t working after a decent amount of time, adapt, go to Plan B, or consult your guide. Life is like the mountain, it gives you immediate feedback about what’s working and what’s not. Feedback that something’s not working isn’t failure. It’s knowledge and applied knowledge is POWER! (7) One step at a time! You reach the top of Mount Everest, and you surmount any of life challenges, by taking it “one step at a time.” Hard times, like a hard climb, can be tiring and we can try to speed up the process by hurrying but this often just wears us out. Challenges require us to call upon reserves of stamina and endurance we didn’t realize we had, but each step brings us closer to our goal. The journey always makes us stronger in the end! Good luck climbing. You’ll be stronger and better for having taken the journey!